6 Byrhh 1947, This is one of several watercolours of this scene painted during Sax’s fors French trip. 10 Boys Inverleith, Watercolour 1950. An abstraction of boys playing with toy boats on Inverleith pond. This is an early move into less representational work and it also picks up on the style of enclosing elements in grids or boxes that was explored more fully in tapestry designs, see 14 and 27 for examples. 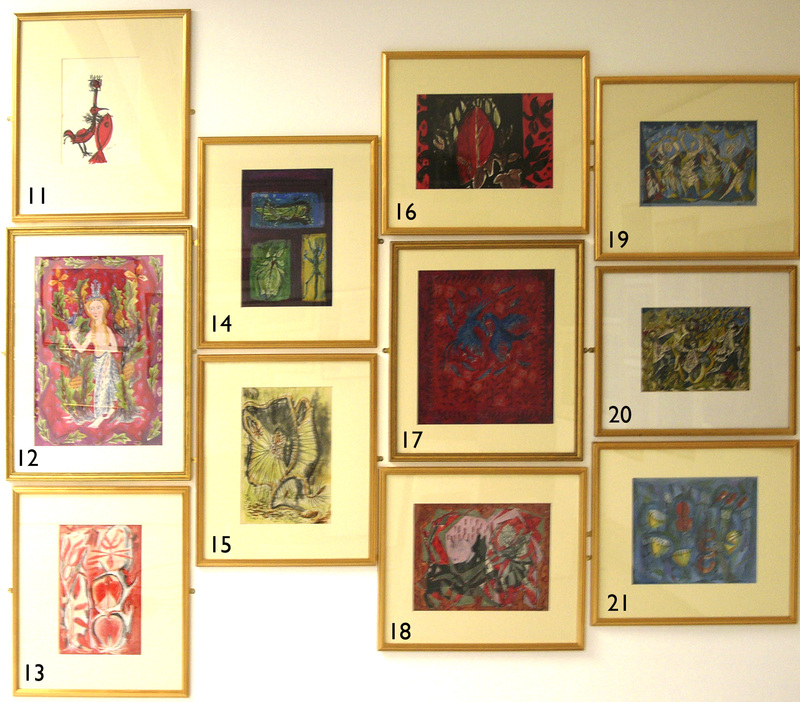 This is a selection of tapestry cartoons and studies created between 1947 and 1958 some for the Dovecot some intended to be woven by Sax. 14 Insects 1956, A much more formal approach typical of the panels designed for the Dovecot to weave speculatively in this period. 16 Leaves 1956, again designed in a free manner this was never woven however it was reinterpreted as a stained glass panel in 1987. Sax made much of the relationship between light and glass and light and tapestry. these panels explored this reflective / transmissive relationship. 18 Theseus and the Minotaur 1954. This design for the Dovecot was woven. It recently changed hands at auction in Christies London. 22 Bull, This panel explores exaggerated lead lines and plating together of two or three pieces of glass to develop colours and textures not available from single pieces of glass. this shows Sax’s interests in pushing the media and techniques to achieve specific design ideas. 23 Old King Cole This is one of s series of designs based on Nursery Rhyms. 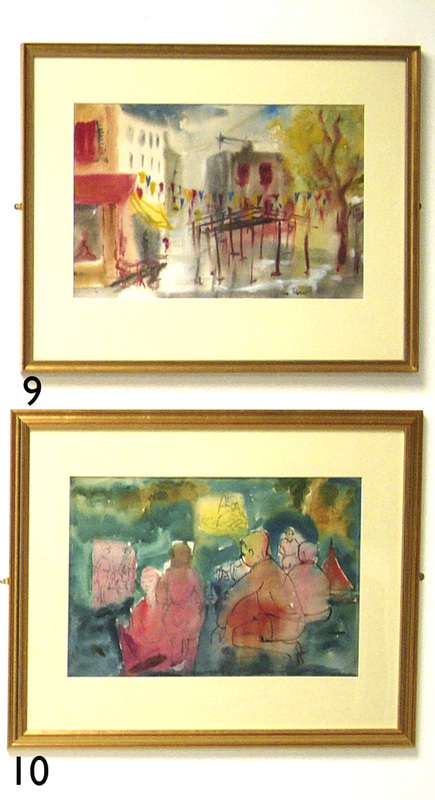 It shows Sax’s painting style as it developed throughout his figurative stained glass work. Again exploring ideas the cut line and painted subjects cross and break each other dramatically, making a very colourful result. 24 Leaves 1987. This is one of a series of small panels that re-interpret tapestry designs. These were made specifically for exhibition and to explore the possibilities of staining and etching techniques that Sax had developed for restoration of church windows in the late 1970s and 1980s with Christian Shaw. 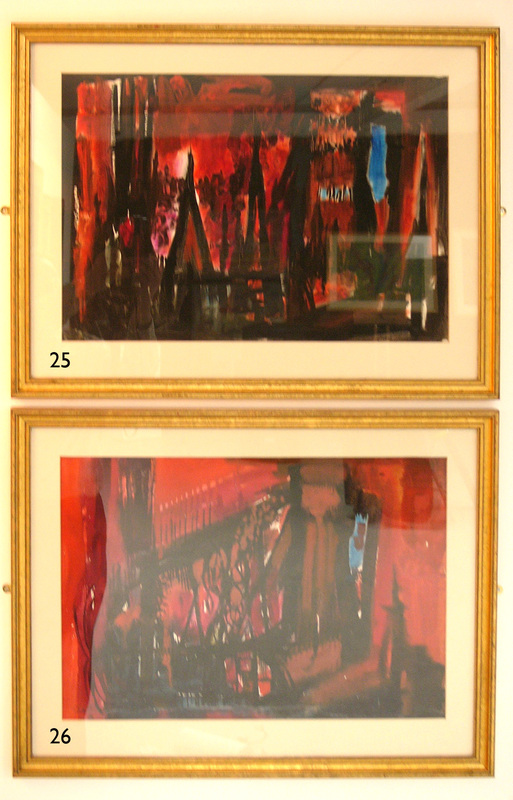 These are two of a series of designs loosely titled Red Cathedral. Although retrospectively dated 1956 it is likely that these were later. It is possible that these were speculative designs based on the bombing of Coventry cathedral. Sax became involved with the new cathedral project through his friendship with the architect Basil Spence. 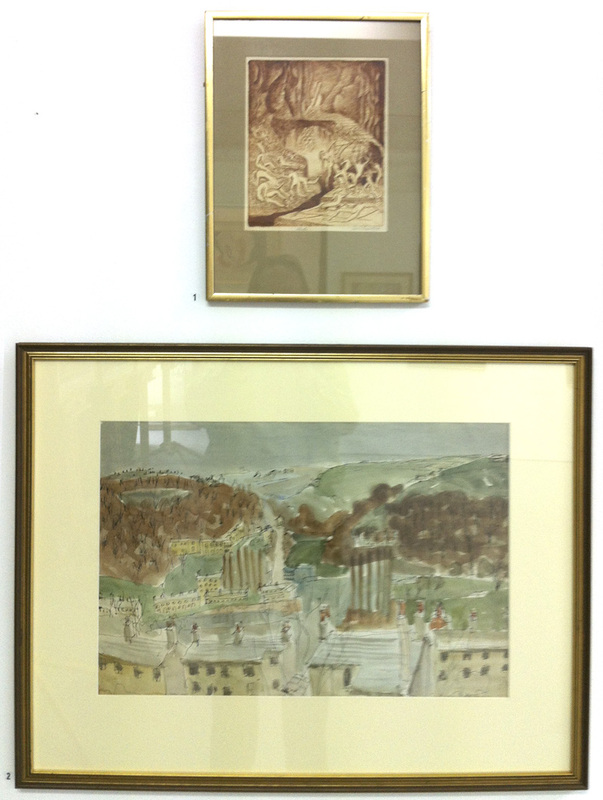 Sax produced a small tapestry for the cathedral project however it was not to these cartoons. The 1960’s saw a change in direction for Sax’s tapestry design. He had departed the Dovecot as he wanted to explore texture and abstract design with more freedom in weaving. Work included both commissions and speculative design. Commisions included his largest panel for Leopold de Rothschilde for which he had to build a new loom. He developed long standing client relationships with the San Francisco architect Henry Hill who incorporated tapestry in many of his residential projects. 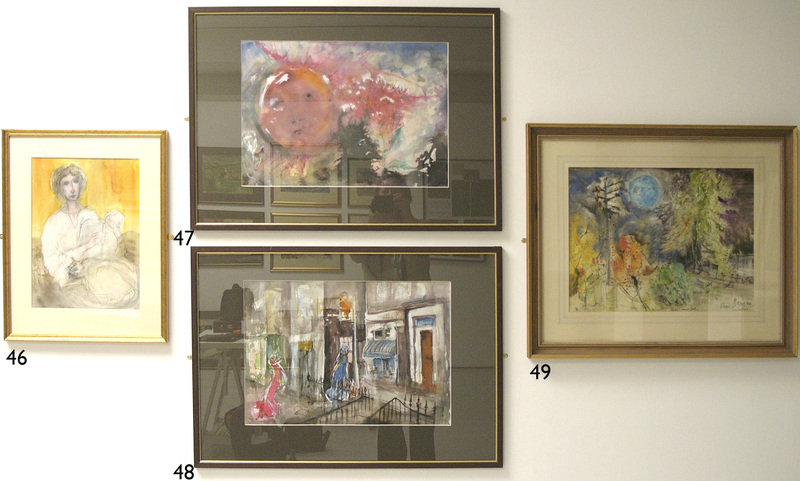 Some of the panels were comissions others were from the speculative designs Sax was creating. Work became so busy that Sax took on James Langham as a weaver and they worked together on many tapestries in this period. 27 Fire cartoon. This mixed media piece reflected Sax’s interest in using texture and variation in materials. The background also reflects earlier designs with enclosed or gridded elements. 28 Orchid Cartoon, One of a series of orchids woven during the 1960’s following from the natural subjects woven in the 1950’s see 30 and 31 for another example. 29 Summertime 1966. This was one of Sax’s favourite tapestries, so much so that he carefully priced it so that it never sold! It is a somewhat fantastical landscape with figures about which he created many stories and interpretations! 30 Lilies 1983, This painting includes Summertime in the background. it is an abstraction of the living room in Howe Street, his home and studio for 46 years. 31 Summertime Cartoon 1966, This is the original painting from which summertime was woven. By this stage his technique for developing the design was to use very large scale black and white photographs of the painted cartoon behind the warp to guide the weaving. Colour and texture were developed as the tapestry was woven. 32 Earth 1957, This cartoon demonstrates the development of textural ideas using a variety of media to express texture on paper that would later be woven into the tapestry. This was one of a seroes of elemental themes and was woven for Henry Hill. 33 Racu 1963. Sax became fascinated with texture in other media. Raku is a ceramic process where pots are taken hot from the kiln and plunged into straw filled boxes to create a surface with a carbon finish that varies from a light grey to a deep black. This design, woven in 1963 reflects these surface effects in the woven work. 34 Blue Line 1960. It seems possible that this is a later interpretation of the Red Cathedral theme abstracted far further than the examples at 25 and 26 again with hints to changes in texture and material in the weaving. 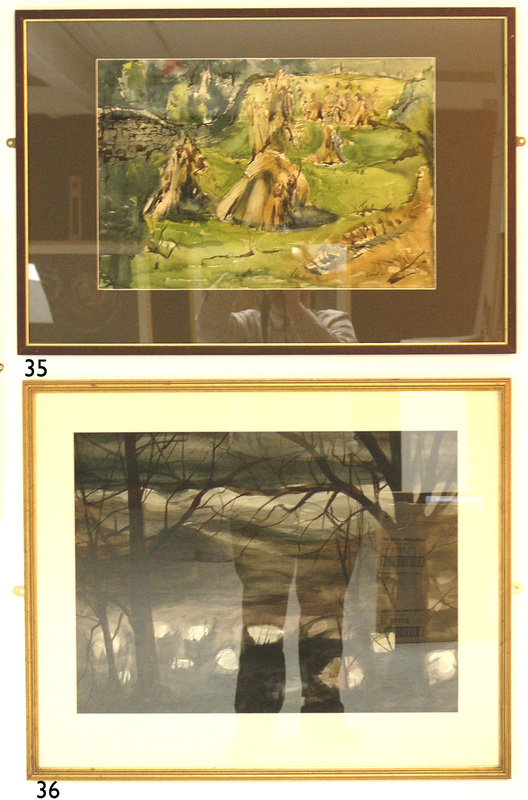 Watercolours remained part of Sax’s work, almost a recreation when away from the loom or stained glass easel. The aspects of abstraction began to permeate this work as some seem to cross the line between watercolour representation and interpretation for tapestry or glass. 35 The Last Harvest 1960, Sax worked as a farm hand during the war. By 1960 the old method of harvesting and making stooks was rapidly disappearing replaced by rectangular machine bales. He saw this field of stooks and painted it for posterity. 36 Sutherland 1960, A typical example of Sax’s developing abstraction in watercolour. Trees held somewhat of a fascination in this period and many ideas were developed in these watercolours that later infomed tapestry designs and glass painting. 37 Man and Geese stained glass panel. Another exhibition panel unfortunately nothing is known about the subject or the reason the panel was made. 37, 38, 39, Cartoons for Liverpool University Tapestry. These are three quite divergent designs for a tapestry woven for Liverpool University. 37 is the closest to the final woven piece, however extant pictures of this panel show further design development that may have happened during the weaving. Sax was very insistent that the weaving was the ultimate in the creation of tapestry, cartoons and paintings were just an initial thought and presentation tool. 40 Cartoon for Camargue stained glass panel. This was commissioned by the Scottish Craft’s Council for a touring exhibition showcasing Scottish design and craft. The panel then became part of the Edinburgh Museums collection. It has now been incorporated in the new displays at the Royal Museum in Edinburgh. 41 Sadie’s Dream 1987 is a mystical design from a dream described to Sax by his sister Sadie Lockwood in their childhood. One of the animals is a rather abstracted rabbit. 42 is a sketch by Maisie of a proper rabbit done during the painting of Sadie’s Dream. It is a rare example of the creative dialogue between Sax and Maisie that was largely confined to dialogue. 43 And a Partridge in a Pear Tree 1987 The style and theme of this design harks back to designs of the 1950’s being quite figurative and literal. 44 Fleur de Mal 1988. This tapestry design relates closely to the style of the 1960s expressing idea to be expressed as texture in weaving, however it has incorporated a small devil figure in the centre of the flower and a moon. This became a strong motif in Sax’s later work. 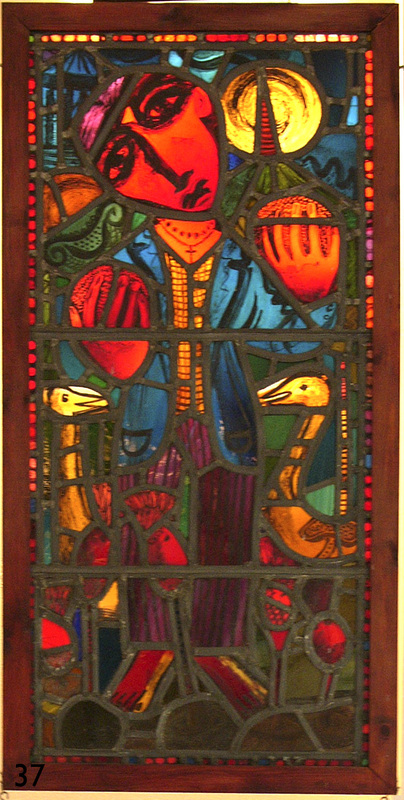 This design was later interpreted in stained glass as an exhibition panel. 45 Panel design dated 1978. This again harks back to early design work in style however incorporating figures and themes seen in later work. Sax latterly returned to watercolours, or more precisely mixed media as these incorporate ink, crayon, marker pen, pencil and in fact almost anything that can make marks on paper! Work in this period ranges from portrait sketches to incredibly free expressive pieces all intended as personal expression. 46 Shona and cat. a developed drawing of Sax next door neighbour. This period saw numerous sketchbooks filled with quickly executed portrait sketches often made in the local pubs. 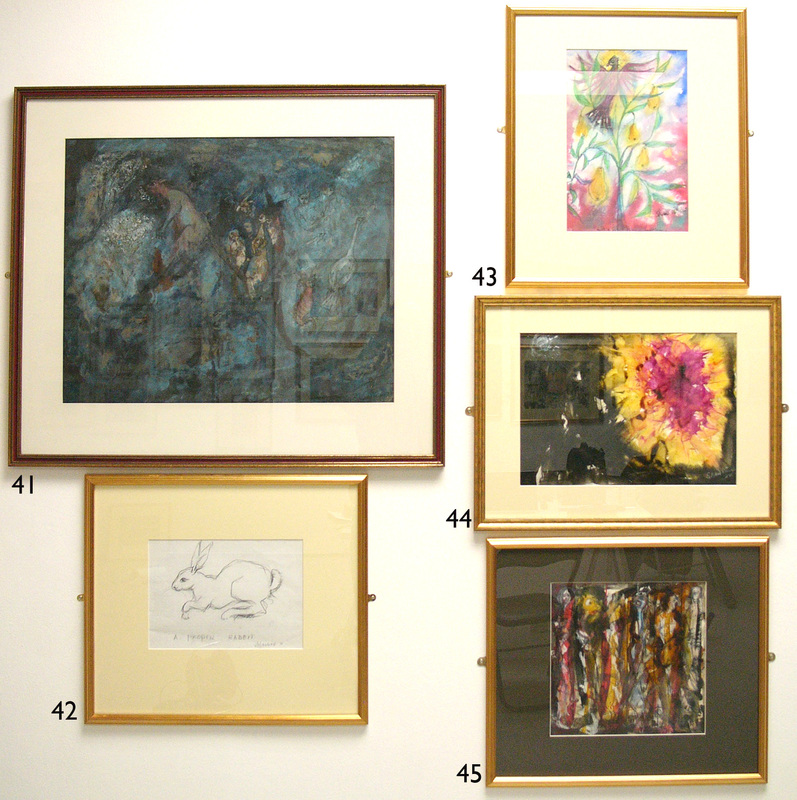 A few were developed like this into more formalised drawings and paintings. 47 Babyface Moon 1987. Latterly Sax believed the full moon enhanced his creativity and certainly his creative output increased during this phase of the moon. Sax was influenced by the excitement of space through the 1960s and 1970s with many designs influenced by the space race. 48 Arles in Howe Street 1984. Much of Sax’s output in the 1980s contains themes or views in or around his Howe Street home. Events would spark ideas, this painting recording the appearance of a pair of flamboyantly dressed women in the bus queue outside his studio window. 49 Night must Fall 1984. The confluence of Halloween and a full moon inspired this exuberant abstraction of the view from Sax’s bedroom in Howe Street. 50,Sun, 51 Earth, 52 Moon, 53 Wind. These are a group of cartoons for tapestries designed in the late 1960’s. These formed part of a series of abstracts exploring large themes that were particular favourites of the San Franciscan Architect Henry Hill and woven during Sax most productive period for tapestries with James Langham weaving alongside Sax. 54 France, 55 Paris. 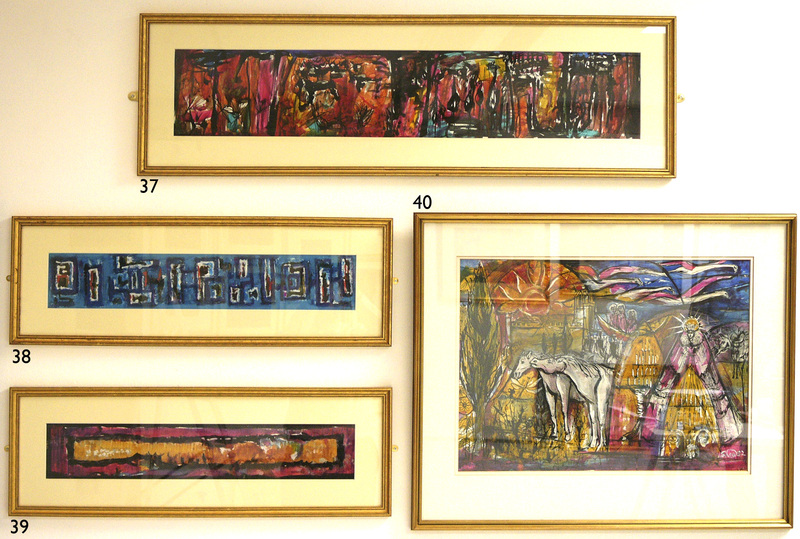 These are some of Sax’s rare excursions into oil painting. 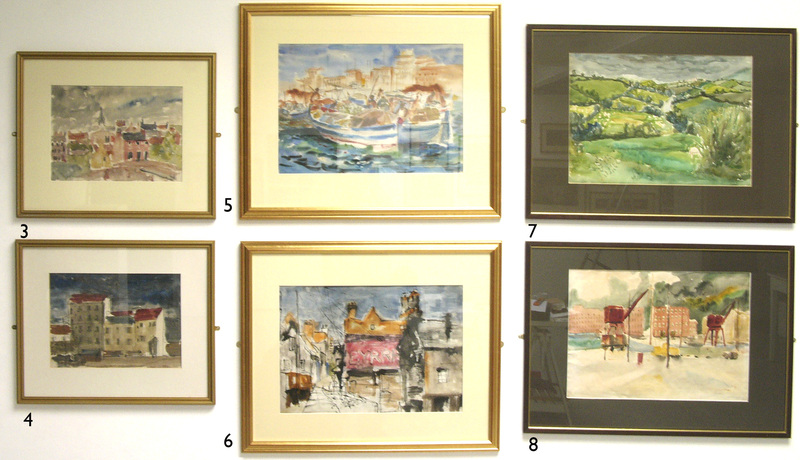 these must have been studio pieces worked up from watercolours that Sax had made during his earlier French trips as can be seen if you look at number 4 which is clearly the model for 55. Sax enjoyed working quickly when creating and it is though t that oil painting was just too slow a process to satisfy him. 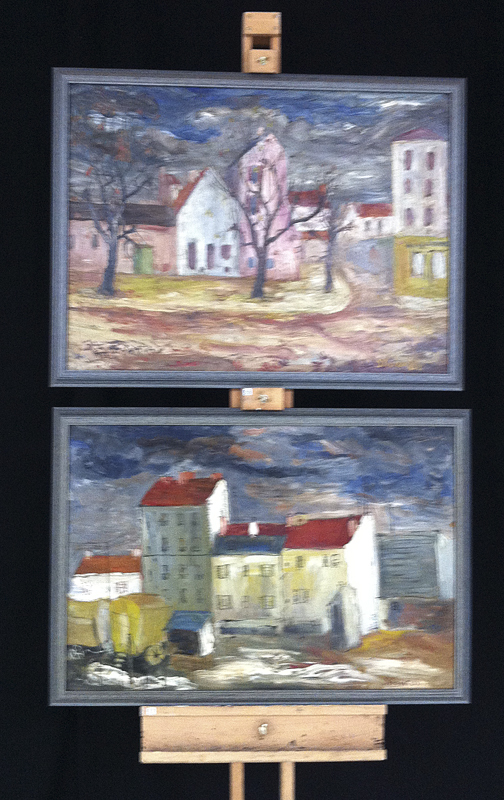 Even these show a style similar to Van Goch where a lot of paint is applied very quickly and thickly. Despite the limited exercise in oil painting Sax still shows how he could adapt and communicate line, colour and form in any medium he chose.